Composing a manuscript in virtual space involves layer upon on layer of context invisible to the naked eye. Documenting and making such information accessible could open up new, but largely overlooked, lines of inquiry within the arts and humanities. 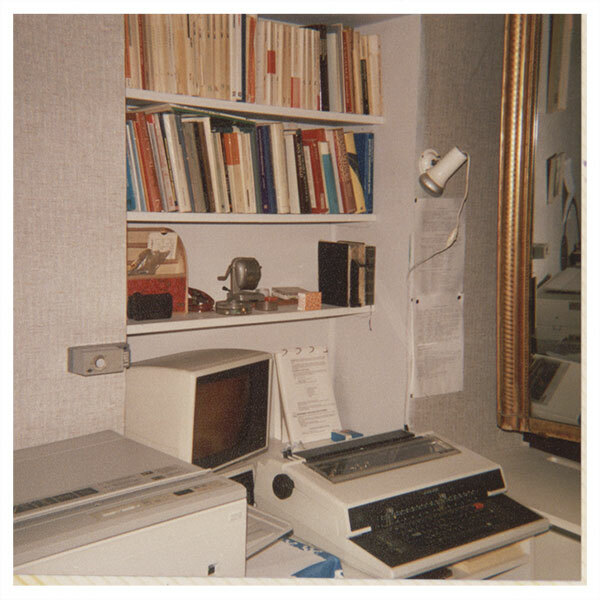 Since opening access to born-digital collection materials, the Ransom Center has heard from researchers interested in discovering what kind of impact computer technology made on an author’s writing. Questions have ranged from which models of Macintosh computers Gabriel García Márquez used to compose which works to how J. M. Coetzee’s experience as a computer programmer in the 1960s dictated what software he selected to write his novels, and why Christine Brooke-Rose chose to write her later, more experimental novels on what was, at the time, a high-end hybrid typewriter/word processing machine. Preserving and reconstructing context can be challenging for two-dimensional paper-based materials, but it is far more complex for electronic files. Not only is the content of the file key to research, but so too may be the technology the author employed to create it, from the computer model, operating system, and software used to file naming conventions and embedded metadata like timestamps. How did the author’s writing style change with the adoption of new technologies? What differences become apparent when comparing an author’s manuscripts drafted by hand, typewriter, and computer? What pieces of history have been lost in the midst of technological advancement and why? What can those gaps themselves reveal about a person and his or her concern or disregard when it comes to preserving one’s digital legacy? The following examples from the Center’s collections show the abundance and complexity of technological influences on contemporary literature. And they are part of a bigger story yet to be told, a tale about computer history and its impact on artistry, on a writer’s evolving mode and style of composition. One of the Center’s earliest acquisitions of digital media is from the Christine Brooke-Rose papers. Brooke-Rose is known largely for the experimental novels she wrote later in life. Within her materials are several 5.25-inch floppy disks containing drafts of her science fiction novel Xorandor (1986). Brooke-Rose wrote these on an Adler ScreenTyper. The ScreenTyper, which connected to most Adler electronic typewriters, touted an 8-bit processor and Control Program for Microcomputers (CP/M) as its operating system. The Center also holds the papers of South African author J. M. Coetzee, among which are nearly 130 floppy diskettes containing drafts of various novels and essays. Surprisingly, Coetzee was writing with an early version of WordStar for IBM compatibles into the late 1990s, at a time when most PC users had upgraded to a Windows operating system and Microsoft Word. Many writers were, and still are, committed to WordStar, the most well-known being fantasy author George R. R. Martin. At a time when WordStar files by default did not have an extension, Coetzee developed his own conventions when naming files. For instance, he used the extension .NOT to indicate his notes (either research or editing) or a .V followed by a number to label different versions of his drafts. Essays were labeled with the suffix ESS, interviews with INT, and literary reviews REV. 5.25-inch floppy disk from the Julia Alvarez papers, circa 1984. Julia Alvarez’s papers came to the Ransom Center in 2013. 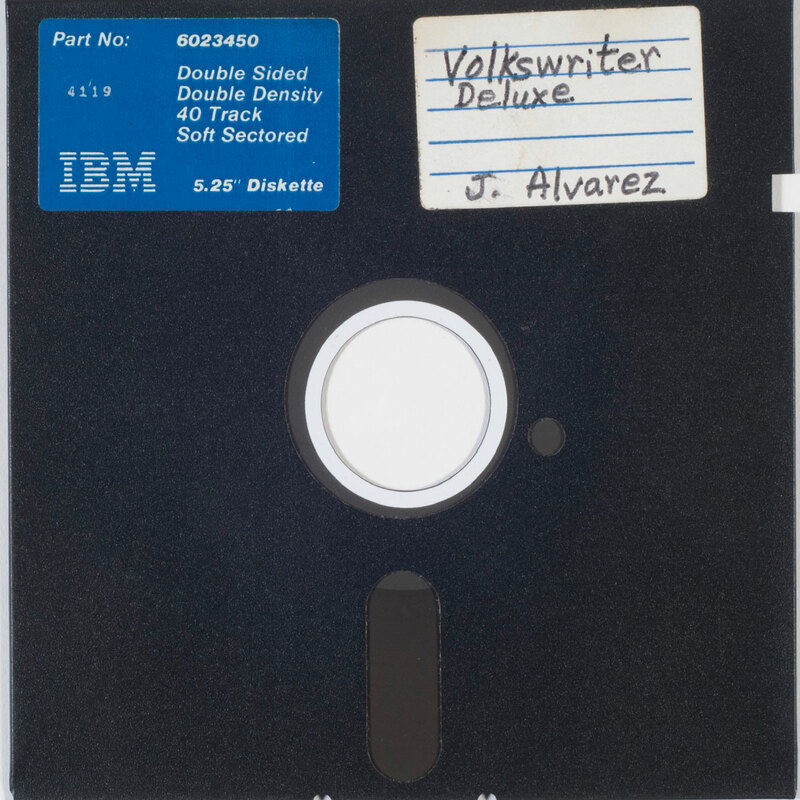 Included in the collection are 15 5.25-inch floppy disks containing drafts of short stories Alvarez wrote in the mid-1980s on her IBM personal computer. The majority of the drafts were written in the word processing program Volkswriter. Although largely forgotten in computer history, Volkswriter was actually quite popular among IBM users prior to the rise of WordStar. The literary manuscript collections at the Center reflect a preference for Macintosh among contemporary authors. The Gabriel García Márquez archive arrived with a total of five computers, two of them Macintosh Plus models, one IIcx, a G4, and a PowerBook. García Márquez was an early and dedicated Macintosh user throughout his life. The first major work he composed on a computer was Love in the Time of Cholera, published in 1985, less than a year after the first two models of Macintosh computers debuted to the public. García Márquez was not necessarily remarkable in this respect since Apple is known for marketing to creative types, which made many writers and artists take notice. Some of them whose papers are held at the Center are Iain Sinclair, Billy Collins, Leon Uris, and Michael Joyce. 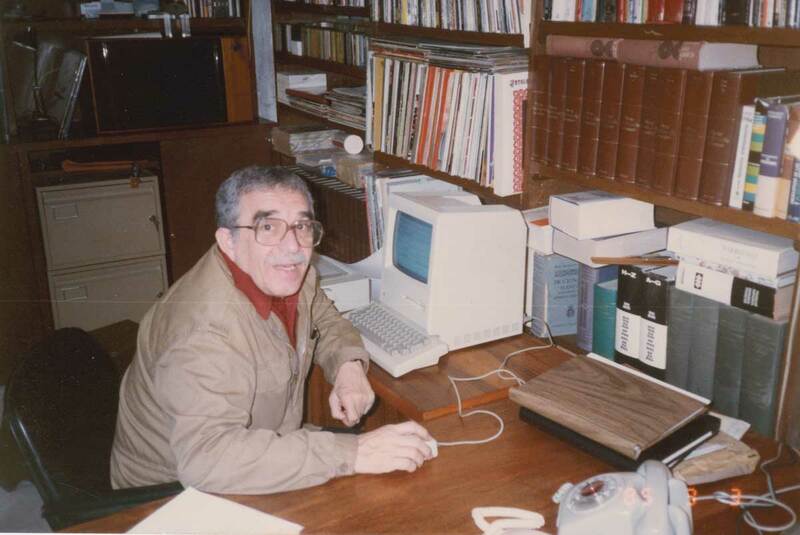 Gabriel Garcia Marquez in his study, March 1985. Details about a creator’s use of technology are often overlooked with literary manuscript collections, but they are key to providing context to born-digital materials. Archivists at the Ransom Center continue to dig up these important facts in order to provide an authentic representation of collection materials and preserve the past. Items from the born-digital collections of Christine Brooke-Rose, J. M. Coetzee, Denis Johnson, and Gabriel García Márquez are on view in the exhibition Stories To Tell through August 12, 2018. This article originally appeared in our Spring 2018 issue of Ransom Center Magazine. Top image: Christine Brooke-Rose’s workspace.